Comparison of Aggregate series rockets. Ares V (left) and Ares I rockets. NASA's Ares launch vehicles were intended to support human space exploration beyond 2012. They were meant to replace the Space Shuttle, ferry astronauts to and from the International Space Station, return them to the Moon, and later help take them to Mars and other destinations. Project Constellation, of which the Ares launch vehicles were a central hardware component, was cancelled in 2010. Ares is the Roman name for Mars. The Ares I rocket was to have launched the manned Orion spacecraft. The larger and more powerful Ares V was to have launched cargo, including components needed for future lunar missions. The "I" and "V" designations paid homage to the Apollo program's Saturn I and Saturn V rockets, the first large U.S. space vehicles conceived and developed specifically for human spaceflight. Both Ares rockets are based extensively on Space Shuttle technology. The Ares I was to have used a single five-segment solid rocket booster, derived from the Space Shuttle's solid rocket booster, for the first stage. A liquid oxygen/liquid hydrogen J-2X engine derived from the J-2 engine used on Apollo's second stage would have powered the second stage. The Ares I would have stood 309 feet (93 meters) high, had a gross liftoff mass of 2 million pounds (900 metric tons), and been able to place a payload of more than 55,000 pounds (about 25 metric tons) into low Earth orbit. The Ares V, a heavy lift launch vehicle, would have used five RS-68 liquid oxygen/liquid hydrogen engines mounted below a larger version of the Space Shuttle's external tank, and two five-segment solid propellant rocket boosters for the first stage. The upper stage would have used the same J-2X engine as the Ares I. 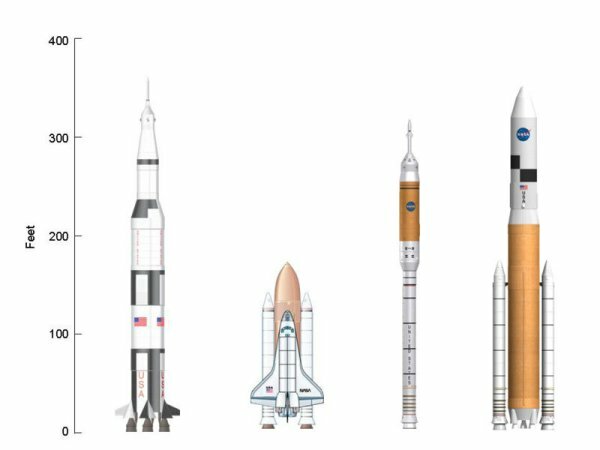 The Ares V would have been able to place more than 286,000 pounds into low Earth orbit and stood approximately 360 feet tall. This versatile system would have been used to carry cargo and the components into orbit needed to go to the Moon and later to Mars.